Colorado legislation requires local school districts to adopt graduation expectations that meet or exceed the state guidelines for graduation. These new expectations are in effect for the Class of 2021 and beyond. The Littleton Public Schools Board of Education has adopted new graduation requirements in accordance with Colorado law. (See LPS Board Policy IKF: Graduation Requirements.) Beginning with the Class of 2021, Colorado graduates must successfully complete the graduation course requirements for their high school, successfully complete the Individual Career and Academic Plan (ICAP) process, and demonstrate competency in English and Mathematics. What Do These Graduation Requirements Mean for LPS Students? Students must successfully complete the graduation course requirements for their high school. LPS provides a comprehensive high school experience where students have multiple opportunities to explore a variety of pathways of interest in addition to completing a rigorous core academic program. Successful completion of credit requirements represents mastery of the Colorado Academic Standards in several courses of study. Each high school provides information about its graduation course requirements in its Course Guide (you may find each course guide on the school websites). Students must successfully complete the Individual Career & Academic Plan (ICAP) process. The ICAP is a personalized career and academic planning process designed to help ensure academic success for each and every student. (See more information about the ICAP process.) Every LPS graduate is required to complete the ICAP process. Quality Indicators on an ICAP include self-awareness, career awareness, postsecondary aspirations, environmental expectations, academic planning, employability skills and personal financial literacy. Students must successfully demonstrate competency in English and Mathematics. Graduates must demonstrate competency on at least one of the district adopted measures in both English and Mathematics. Why does LPS have new graduation requirements? State statute requires local school district boards of education to establish requirements for students to receive a high school diploma. These local requirements must align with guidelines approved by the Colorado State Board of Education. What is the purpose of the new graduation guidelines legislation? The Colorado State Board of Education is articulating Colorado’s shared beliefs about the value and meaning of a Colorado high school diploma. The Colorado State Board of Education is also outlining minimum components, expectations and responsibilities of local school districts to demonstrate to employers, military recruiters, college admission teams and other training programs that Colorado graduates are ready for the next step after high school. Who is affected by the change and when does it take effect? All Colorado school district graduation requirements must be in alignment with the State Board of Education’s graduation guidelines prior to the Class of 2021 entering high school. Does this change affect current high school students? It starts with the graduating Class of 2021. How are these graduation requirements different than what is currently in place? Currently, students only must successfully complete the course requirements outlined at their high school. Beginning with the graduating Class of 2021, students must also complete the ICAP planning process as well as demonstrate competency in mathematics and English. How are LPS’ new graduation requirements better for students? Students can now earn high school credit prior to 9th grade. There are more opportunities at the high school level for course alternatives and waivers to promote expanded graduation pathways. The number of credits required to graduate has not changed. The intent is not to graduate early, but rather to open more pathways for credit completion. This means that students will have more opportunities to take classes in their areas of greatest interest. Are the new graduation requirements more rigorous? Yes. High school students already have been involved in the ICAP process and already have been demonstrating competency in mathematics and English. There are many opportunities and multiple ways to meet the graduation requirements, and the vast majority of students will exceed what is required to graduate. Each high school provides a detailed course guide and planning tools that clearly outline expectations and help guide students and families through the steps toward graduation. Students, parents, and counselors will work together to outline academic pathways that best meet the needs of students. 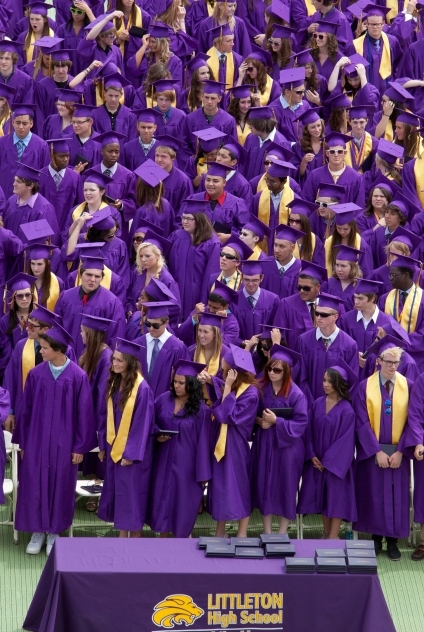 Will credits earned prior to high school count toward the new graduation requirements? Yes. Board policy IKF allows students to earn course credit toward the LPS graduation requirements prior to entering high school beginning with the 2016-2017 school year. The following courses can be counted as credit-bearing courses prior to high school: Algebra I, Geometry, Algebra II and World Languages. Credit earned through successful completion of one or more of these courses will be reflected on the student's high school transcript. Course completion will not count toward a student's grade point average (GPA) in high school in LPS. GPA calculations will begin when students officially begin their freshman year of high school in LPS. Each of the three LPS high schools have in place rigorous graduation requirements that prepare students well for college, another kind of postsecondary education, or for the workforce. Review each school's course guides to view specific graduation requirements. Visit the Colorado Department of Education's website to learn more about the process, the statewide timeline, and the CDE's approved Menu of Options.